Join Our FREE Canva 101 Workshop!! 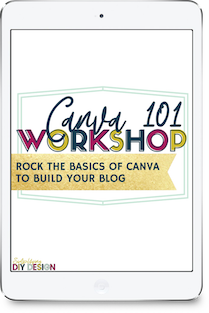 Sign up for our free Canva 101 Workshop & learn how to rock the basics of Canva for your blog! 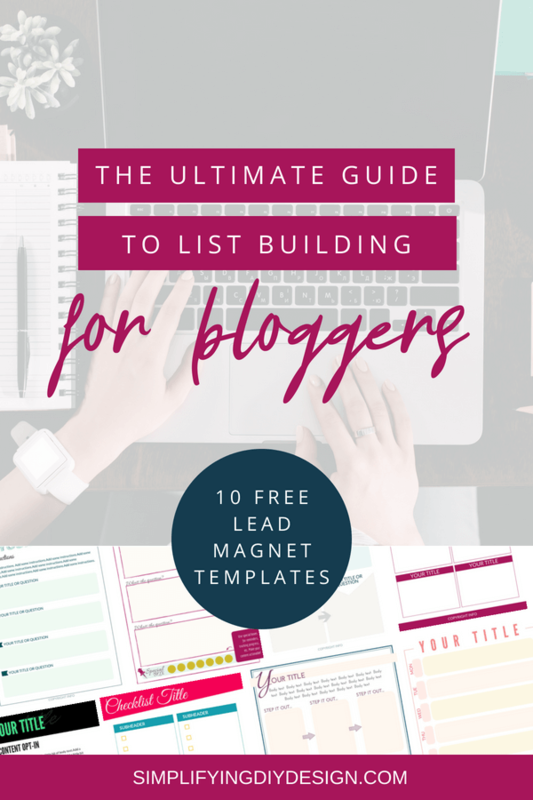 The Ultimate Guide To List Building + Templates and Tutorials! Do you remember your first subscriber? I do. Not their name, but I definitely remember calling my husband at work to tell him that someone actually subscribed to my blog. Even though they were a random person on twitter that only subscribed because they wanted me to subscribe to their blog. Even though I had no idea what I was doing, no opt-in, and had no clue what an avatar even was. I had no strategy and I definitely had no idea that ALL of those things goes into building a list. I knew it was important to have an email list. But I didn’t know what to do and how to build it. I eventually learned a lot about list building. I learned about opt-ins and welcome sequences and strategy. But I can’t help but remember feeling how frustrating it was to fight for my first 10. Let alone my first 100 or even 1000 subscribers. I read so many articles of people getting 500 subscribers in their first month and I just wanted to scream! What were they doing that I wasn’t? What was I doing wrong? So when I was getting ready to launch Simplifying DIY Design at the end of October, I knew my very first goal was to get 1000 subscribers. I didn’t care that I had no traffic. I didn’t care that I didn’t have a waitlist– I was determined. I implemented the strategy I learned from List Love (you can read all about how I grow my list by 1000+ subscribers each month right here) and I couldn’t believe it. I wasn’t fighting for 10 or 100 anymore. Just in the month of January, I got 456 amazing new subscribers! 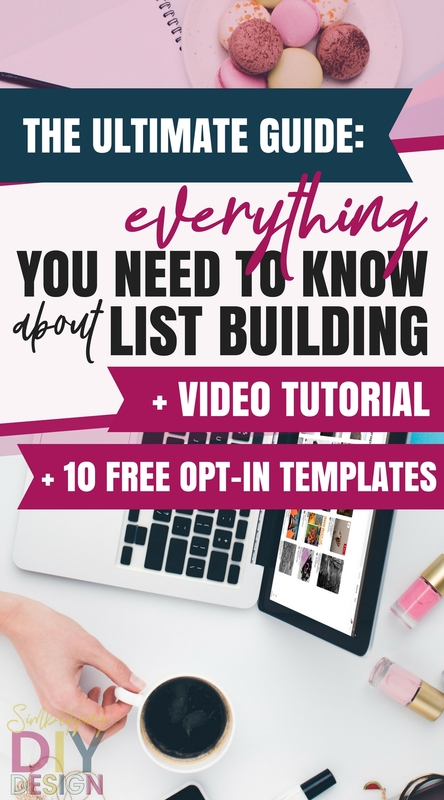 I had learned a lot about list building prior to List Love, and thought I’d heard it all before (you know that feeling?) but this strategy was completely different than anything I had learned about before. Turns out I was actually making it a lot harder than it had to be. It was kind of like a facepalm moment as I was going through the course. This course implements a very specific strategy that involves multiple lead magnets… it was a game changer. Grab 10 already designed for you Lead Magnet Canva Templates.. because wouldn’t it be nice to be able to create beautiful, irresistable lead magnets in half the time? Click here! Anyway, I wanted to share some tips about list building: hoping it helps some of you! ALL ABOUT LIST BUILDING: Techniques and design tips + tutorials! *NOTE: List Love is now available all the time– at the time of this video it was limited enrollment. Click here to check it out! You must, must know your avatar. On a creepy level. And you’ve probably heard this before but it’s SO true. This was the #1 mistake that I made when first starting out. I was trying to be all inclusive and talk to everyone. I know first hand how detrimental that is to list building. 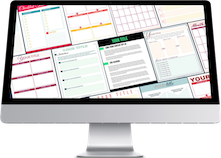 Recommended resource: Date Your List— seriously, it was a game changer! To offer your avatar something they really need, you must pay attention to what they are saying. Join Facebook groups where your avatar is likely to be hanging out and go a little under-cover. Pay attention to the questions they ask and read the frustrated vents they share. Keep a list of their problems handy (I use google sheets) even if you don’t know how to solve them yet. See how those problems relate to your blog and your top posts. I’m no stranger to thinking an idea is a winner and then putting it out there just to get crickets. They are telling you what they want– you just have to listen. While you are in the Facebook groups- learning all about your avatar, pay attention to the wording they use (especially when they are frustrated) this will help you write your sales copy in their language so they KNOW your lead magnet is meant for them and exactly what they need. Getting specific is how your avatar is going to be attracted to your lead magnet. For example, “The ultimate budget guide” vs. “The ultimate budget guide for moms”. People who are not moms are likely to sign up for the first, but not the second. But if your blog is a mom-blog and most of your affiliates and products are geared towards moms– why do you want non-moms on your list? The list gets more expensive the bigger it gets- so you want to make sure that each person that’s on it is a quality lead. While I believe that content is more important than design in the long run, I do think that design plays a part in getting your lead magnet noticed. It also plays a part in usability. People can’t get value from your freebie if it’s so disorganized or messy that they can’t use it. Another reason that conquering design is important is that I feel that it paralyzes people. They have an idea but they don’t know how to create it so they just don’t. You can’t see if it resonates with your people if you never even get it out to them. Side note: need help with design? Check out my Lead Magnet Design + Set up Workshop! Not all your ideas will be winners. And that’s ok. I promise you that even those people with the “how I got 500 subscribers in my first month” blog posts have also experienced failure before. They are also most likely not brand new to blogging or online business- they have a network of people that they are able to drive to their offer. Give a new lead magnet a few weeks to see if it gains traction. And definitely promote, promote, promote! The last thing is: strategy. Strategy is so important when it comes to list building. There are so many pieces to list building: the design, the content, the promotion, the Facebook ads, the tripwire, the welcome sequence, etc etc etc. I’m a creative person. Strategy isn’t my strong suit and I’ve invested in a TON of list building resources. List Love is by far the best email growth course I’ve taken. It was so nice to have the strategy laid out for me. I just had to implement it! There are a lot of moving pieces to building your list. Which is why it can be so overwhelming when you are just trying to conquer the email list hurdle of blogging. Start with an idea, use a template to get it designed (trust me, it will save you a TON of time) and get it out there. In case you missed it, the video above goes over the techy stuff of hooking it up to your email service provider. JUST FILL OUT THE FORM TO BE ADDED TO OUR EMAIL LIST AND GET INSTANT ACCESS TO THESE FREE CANVA TEMPLATES! 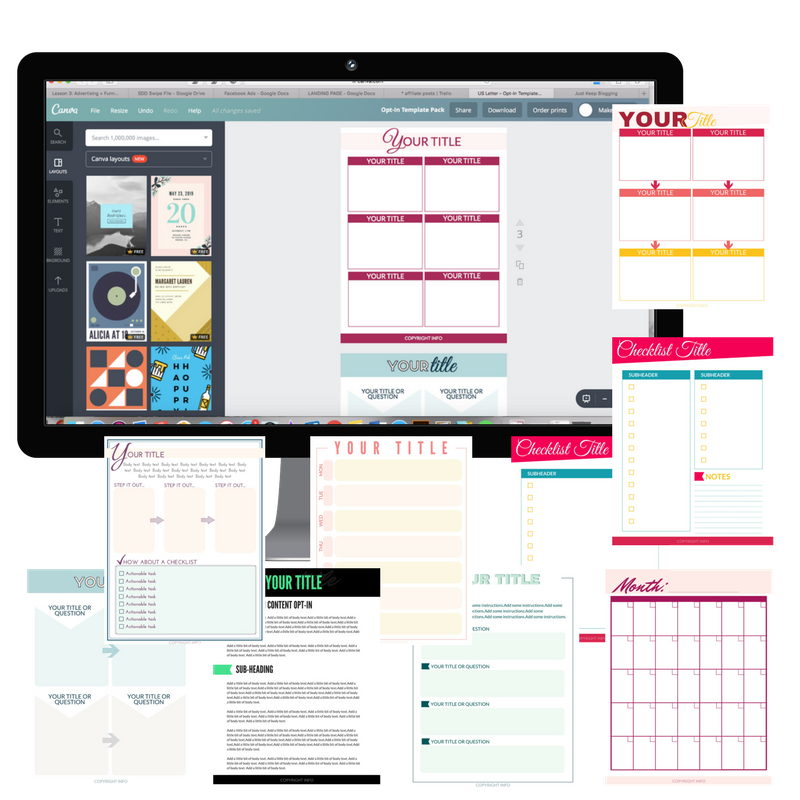 Get access to all of our free editable templates, step by step tutorials, and design tools! Start saving time and your sanity! FILL OUT THE FORM BELOW TO BE ADDED TO OUR EMAIL LIST AND GET INSTANT ACCESS TO OUR DESIGN LIBRARY! Your Privacy is protected. I hate SPAM and promise not to send it!